All games in tagged with "Mark Davis The Fishing Master"
Mark Davis' The Fishing Master (大物ブラックバスフィッシング 人造湖編?, "Oomono Black Bass Fishing: Jinzouko-Hen") is a Super Nintendo Entertainment System fishing video game that features fishing in rural lakes.The game also featured Mark Davis' voice. It is also known for its status as a cult video game due to its difficulty level and attention to detail about lures and weather effects. 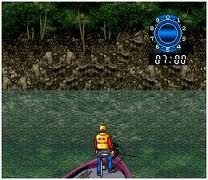 A sequel, Mark Davis Pro Bass Challenge, was released in 2003 for PlayStation 2 and 2005 for Nintendo GameCube.